After a bit of a late start we decided to head to Walensee for a walk along the north side of the lake, from Walenstadt to Weesen. We had decided to take the lower of the two routes through Quinten, as the visibility was good (no fog) and we’d started a bit late for a long walk. The route was very easy to follow, with only a couple of steep and sheer sections which made it a T2 although these were quite well protected with wire fences and chains to hold. The route has two ascents, the first near the start and the second a little over half way through, but together they total nearly 3,200 ft. 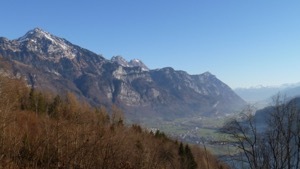 There were lovely views back down the valley towards Walenstadt and across and along the lake to Weesen, although the weather had closed in a bit by the time we were approaching the end of the walk. The last section was a bit dull, following a narrow road along the lakeside where we had to make way for cars. We made it to Weesen just in time to catch a bus to Zeigelbrucke, and then caught the connecting train back to Walenstadt (quite grateful for the typically Swiss level of organisation). Overall the T2, 12.1 miles with 3,200 ft ascent/descent took us 4hrs 5 minutes, and the GPS plot of the route is here. Still not feeling 100% after a bit of a cold, Jules and I decided to try an easier walk, up the Etzel from Pfäffikon. There was thick, low fog covering the lake which stretched up to about 100 yards, but we quickly climbed out of that and into a beautifully clear day. The walk climbs pretty steadily out of Pfäffikon, completing the 2,000 ft of climbing a bit less than 3 miles, mostly through trees, and following well signed paths. At the top we were greeted with spectacular views over the fog covered Zurichsee, and across the valley to Einsiedeln with the Grosser & Kleiner Mythen in the background. 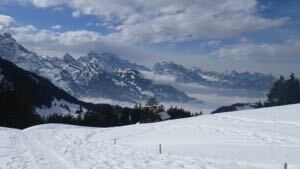 The view was also excellent to the south, with Säntis and Glärus visible in all their glory. We followed route #4 from Zuercher Hausberg up to the Etzel, and then looped back down to Pfäffikon following a slightly different route. Overall the 6.6 miles and 2,300 ft ascent/descent took us 2hrs 40 minutes (plus one break and lunch), so a fairly decent pace. The path was easy to follow and was T2 in places on the steep ascent through the woods. The GPS plot of our route is here. Deciding that we fancied a quick stretch of the legs, Jules and I headed to the Glarus region for our first winter walk of the season. We didn't want to go too far or too high so we chose a fairly short circular route around Mullerenberg. The area is quite picturesque, and afforded lovely views over Glarius and Vorder Glarnish and down to the plains towards Zuerich. All in all the 3.1 miles too us 1hr 20 of walking - some of that in calf deep snow. The GPX plot of our route is here. 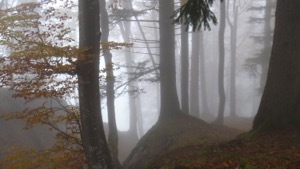 With pretty heavy fog forecast for most of the Zuerich area, Jules, Diana and I headed out to Affoltern to try to get above 600m (the limit of the fog) but not into the mountains proper as we didn't fancy a full on winter walk. 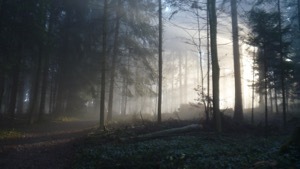 The chosen route was a circular walk from the town of Affoltern, taking in the Thurlesee, and which dipped in out out of the fog line, which made for some interesting (and in places quite spectacular) scenes and photos. We stopped for a good lunch in Restaurant Muehleberg in Aeugstertal, which was about a third of the way into the route, in the direction we chose. All in all the route was T1 and 10.3 miles with 1,600 ft ascent/descent. It took us 3hrs 20 minutes of actual walking time, and the gpx plot of our route is here. 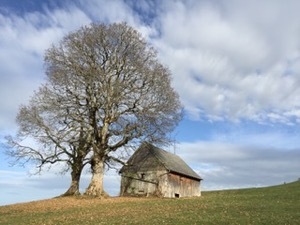 With the weather looking unseasonably warm and sunny for November, Stu and I decided to try one of the circular walks recommended in a COOP walking guide (its not just food that comes from COOP!). 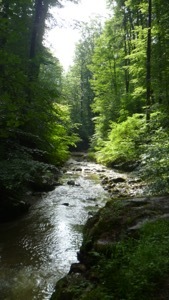 The walk starts and ends at Lichtensteig and takes in several smaller peaks over a distance of 18km. Having found an easy, Jules-friendly and appropriately (over) priced parking space at the station the walk starts flat for the first 4k, followed by a fairly steady climb to get the heart rate going. We were soon rewarded with great views and as we passed a little farm shop we stocked up on home baked Christmas cookies to keep us going. After gaining most of the initial height, and meeting some very curious baby cows we stopped for lunch at the Restaurant Churfirsten. This turned out to be a very busy but well managed restaurant with a particularly friendly Swiss couple on our table and several dogs – some more spoilt rotten than others! After lunch beware as two more climbs await, although with a great view over Santis and Toggenburg weather permitting. The final climb leads to some old ruins, perfect for a stop with a cup of tea and cookies. Feeling generous we left the aniseed cookies for the birds! The descent back to Lichtensteig is pretty easy and partly on a quiet road, with some nice views over the town and the river flowing through it. All in all we would recommend this walk, with good paths over fields and some great panoramas. A good option for late autumn or Spring when the days are getting shorter. Some steep descents that might be slippery when wet, so best done in dry weather. The GPX plot for our route is here. With a truly glorious day forecast, Jules and I headed over to Steg to do a circular walk taking in the Schnebelhorn and some nearby peaks. The weather was everything that was promised and the car-parks in Steg were rather full, but we eventually found a space near the ski lift. After a brief second breakfast in a café we headed off on the route. The route itself was clearly marked, and easy to follow on the maps. 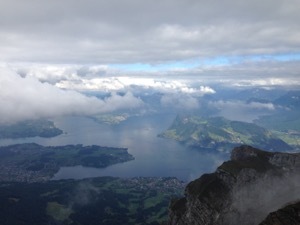 We climbed steadily out of Steg towards Roten taking in the rather special views over the surrounding countryside. From Roten the route follows a ridge south to the peak of the Schnebelhorn, with just one final push to get to the top. Arriving we found that we weren't the only people with the idea of a day out – the 20C had the hill-top covered in walkers and people enjoying the weather. From the top we headed down to grab a bite of lunch in Tierhag (we weren't alone, and the service was having a little trouble keeping up with demand) before dropping down off the main path to route back to Steg. The route would definitely be better in good weather – not that it would be dangerous in anything other than deep snow, but because the main highlight of the walk is the views across the mountains and plains. The first two thirds of the walk were more pleasant than the last section, which was a long flat walk along a logging track by a stream through a fairly sheer valley. Overall, the 9 miles with 2,500ft vg/l took us 3:30 plus the stop for lunch, and it's a T1 with not many challenges on the route, except the descent from the peak of the Schnebelhorn which was a bit steep on grass. The GPX plot of our route is here. With Andreas and Inge over to visit we decided to chance the weather and go for a circular walk around Atzmannig. The views are supposed to be very special (we're told - we've still never seen them), but once again the clouds were not in our favour, and we did another walk in the grey mist! We stopped for a quick break at our now-favourite restaurant - they even remembered us - before continuing on the walk around the ridge. We made a bad decision not to go down on the chair lift, and instead continued on looking for a favourable route down. The weather got a bit worse - wet and quite windy and we were slowed down by the poor conditions underfoot and sub-standard footwear. A useful lesson in not taking any walks in the mountains for granted, even when you're on familiar territory. We did find the route down eventually after a slow, cold trudge along the ridge and from there made steady progress back to the car. We arrived a little cold and wet and grateful for the heated seats! With Jamie and Emma coming over to visit we had a great excuse to head out and see some of what Switzerland has to offer. We started with a stroll through Zürich city centre, and lunch Restaurant Odeon, then took the train up to Uetliberg to walk along the ridge. In the evening we went to Bohemia for a good steak before retiring happy but exhausted. On Sunday we travelled across to Lucerne, to see the (very pretty) old town with a bite to eat whilst the weather cleared. 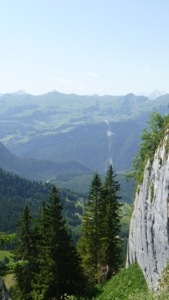 We then headed over to Alpnachstad to take the funicular railway up to the top of Pilatus. Jamie, Emma and Jules all did very well - not being the most fond of heights - and there were some good views through the clouds at times. On Monday we took a tour around the lake on the boat, finishing off with lunch in Fischstube in the glorious sunshine as a grand end to a fun long weekend. To make the most of a slightly overcast and drizzly day, Jules and I headed to Pfungen to try a circular walk from www.outdooractive.com. The route heads out from the town of Pfungen, and then heads up into woodland to take in the views from the Aussichtsturm Irchel. We did the route in reverse, to try to make it to Daettlikon in time for lunch. The start was fairly easy, but then climbed steadily into woodland before dropping back down to Daettlikon. We made it to the Gasthof Traube Dättlikon in time for a very pleasant lunch, before heading off back up the hill. The route climbed fairly steadily to the top of this hill (at about 666m) to take in the views from the top of the tower Aussichtsturm Irchel. From the tower it was a fairly easy loop back to rejoin the path back to Pfungen. The highlight of the trip was the toilet which had been turned into a plant pot, which amused Jules very much indeed. Overall the route was about 6 miles long, with about 1,200 ft. VG/L and took us a couple of hours of walking. The route was very easy to follow, and well signed, aside from one moment where we had to climb over an electric fence. With the weather forecast not so great, but keen to get out and stretch our legs, Diane, Pedro, Louie, Jules and I headed over to Liestal to do the second stage of the long distance ViaGottardo route (#7), from Leistal to Laeufelfingen. The first half of the route was a bit dull, as it followed the train tracks very closely, and was mostly either in town or near major roads, so not so pretty. We stopped in Lausen for an unexpectedly good coffee and patiserie, and in Sissach for a perfectly acceptable lunch. The second half of the walk was much better - with a bit of interesting and pretty countryside including a picturesque railway bridge and good views over the surrounding countryside. 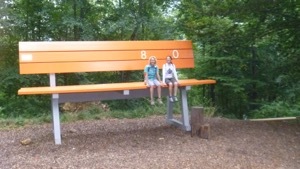 The highlight of the route was definitely finding the oversized chairs very close to the end of the walk, which resulted in many funny pictures. Overall the 12.6 miles and 2,034 / 1,271 feet of ascent/descent took us 4 hours 15 of actual walking, and it's definitely a T1. The gpx plot is available here. 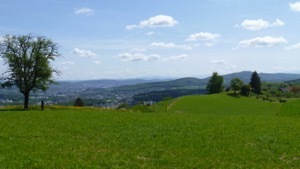 Deciding to brave the hot spell, and wanting to try a T3 walk, I headed over to Mythen Region to walk up the Grosser Mythen. 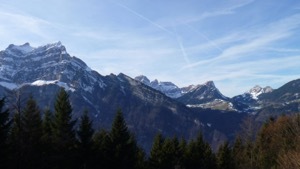 The chosen route was from Zuercher Hausgberge (#8) which was a circular route from Schwyz, via Holzegg, up to the peak and then continuing round the Grosser Mythen, past Zwueschet Mythen and then dropping back down to Schwyz. The forecast was for a hot day, and it rarely got below 30C in the shade, even up on the peak. The climb out of Schwyz was fairly steady, passing out of the town and up into (thankfully) wooded areas before a final clear stretch to Holzegg. This section of the walk was pretty quiet, with only a handful of people the whole way up. The second section of the walk, up to the peak was much more busy, with a steady stream of traffic in both directions on the narrow path. This was my first experience of a T3 walk, and on balance it was fine - a little exposed at times but with a well made path and guard rails in the worst places. However, I would not have liked to do the descent in wet conditions - the polished granite looking like it would be quite treacherous in anything other than good conditions. The view from the top was impressive as expected. I stopped for lunch at the hut there, and to re-hydrate after a fairly hot climb before heading back down. From Holzegg the route round Zwueschet Mythen and down was very pleasant - a well worn and marked track that meandered through woods and alongside fields before dropping down to rejoin the path from the way up. I think I would happily do the route again, but missing out the ascent of the peak and just enjoying the circular route out of Schwyz. All in the route took almost exactly 6 hours, of which I was walking for 4hrs35. The vertical ascent/descent was 4,900ft and the distance over the ground was 9.1 miles, making it a fairly long day given the heat. The walk was rated at T3 for the ascent to the peak, which I can understand and the GPX plot of my route is here. 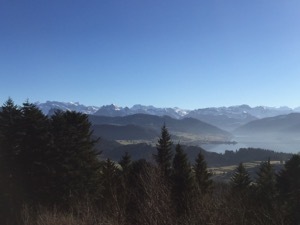 Deciding to take advantage of a glorious weather forecast, Jules and I headed off to Lake Lucerne to try a walk that we'd had planned for a while – up the Rigi from Weggis. The original plan had been to follow route 549 from Weggis up to Rigi Kaltbad-First, and then to take the gondola back down. This was forecast to take 3hrs15 according to wandersite.ch, which we felt was probably about right. Once underway however we made much better time than the website and arrived at Kaltbad-First after about 2 hours of walking. From there we decided to head on up to the Klum (well, it's there – obviously you need to climb it) which took us another 40 minutes. From the top we were rewarded with some rather spectacular views of the mountains to the south and the plains to the north, even seeing as far at the Uetliberg. Unfortunately the trains down from the Klum only run every hour, and having decided not to get on the one that was waiting we elected to walk back down to Kaltbad-First to catch the gondola. 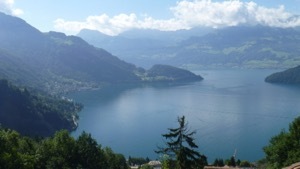 The route itself was very pleasant – the early part climbing steadily through the trees, with lovely views overlooking lake Lucerne. The second half of the walk was much more open, climbing to and then following the ridge to Rigi Klum, with equally impressive views over the Zugersee and the plains. Overall we were walking for 3hrs10 which included 7.7 miles over the ground and 4,300 / 1,200ft ascent/descent. The route was probably just about T2 in places, but well marked, with little in the way of hazards. I'd probably classify this as a good-weather only route. The impressive part is the views, and I wouldn't like to be on the top in a storm. However, the trains do make the summit very accessible, and the stations would offer protection against the elements if required. With poor weather forecast, but keen to get out and stretch our legs, Jules and I headed off to try a walk from www.wikiloc.com, which turned out to be a circular-ish route from the centre of Zürich to Forch and then back again by a slightly different route. The route itself was fairly easy to follow, and was as well signed as we've come to expect. Almost all the route was off road along dedicated paths and in particular the Pfadiweg was a bit of a discovery, following the path of the river out of town through very pretty gullies and valleys.The walk has nice views of both the Zurisee and the Grifensee and would have been even more pleasant without the steady drizzle that accompanied us for the day. All in all the 12.86 miles took us about 5 hours, including a stop for lunch at the Landgasthof Hotel Wassberg in Forch (we weren't very impressed - the food was a bit mediocre for the price and the old boys in the corner having a loud drunken argument didn't help the atmosphere). Although it wasn't hard to navigate the route, we did end up using the online maps and the motion GPX app quite a lot, mostly to make sure that we were on the path that the "official" route followed, although in truth one could quite happily navigate just following the yellow signs, with an understanding of the gross geography of the area and a decent sense of direction. 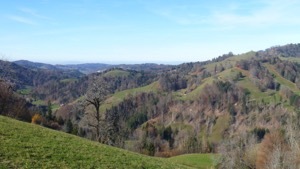 Keen to get out for a bit of a walk, we headed to Deitikon to follow a moderately well known panorama walk to Baden. We were hoping for a pleasant stroll in good weather, and we certainly weren't disapointed. The walk started with a steady climb out of Deitikon, and then headed along the panoramaweg almost to Baden before dropping down into town. We stopped for a very pleasant lunch at Ruesler, about two thirds of the way through the walk, and sat in the sun on the terrace (we weren't alone). 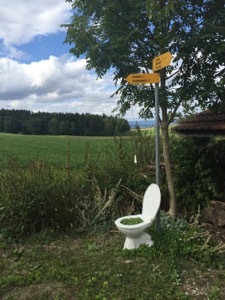 The route was very easy to follow, well signposted on good paths and with good views across the hills to the north-east of Zürich. 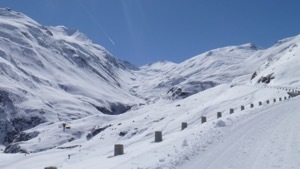 For one last blast of the season, Susie, George and I headed over to Realp above Andermatt to go snowshoeing. This was George's first time on snowshoes, and Susie and I have less than ten trips between us, and with the weather originally forecast a bit variable we decided to take the scenic path up to Tiefenbach. This turned out to be a cat track up the road (closed in winter), so navigation was trivial. The weather was better than we could possibly have hoped - bright blue skies and lovely views of the mountains. We made slightly slow progress owing to a minor injury, but decided to press on to the restaurant at Tiefenbach for a late lunch. Suitably fortified we headed back down, the boys trying some off-piste routes through deeper snow and steeper sections (Beave pioneering the on-your-bum technique for conquering the slopes). We finished with the weather starting to close in, having spent all day in the spring sun (and yours truly needing to learn a lesson about sunscreen in the mountains). All in all it was a lovely day out. The route was 6.25 miles and 2,000 ft vertical ascent/descent. It took us 4hrs25 (lunch not included), and I'd rate it WT1. To try something a little more adventurous, Jules and I decided to try an ascent of the Rautispitz, from Zürcher Hausberger, route #49. This was a bit more strenuous than we'd done previously, being an ascent of 4000ft, and a distance of (check in book). Nevertheless the general consensus was that the route was WT2, and with that in mind we headed off. The route started well, and we climbed steadily for the first hour, making good progress. We stopped for first lunch at the turn-off to the more direct (NOT recommended route) before heading up towards the Rautihutt. Unfortunately the conditions for the only technical part of the ascent were a little beyond our experience - a traverse along a fairly narrow ledge above a steep slope is not what we had in mind for only our fourth outing in snow shoes, and with discretion proving the better part of valour we decided to turn back. We made the descent in good time, following mostly the route we'd come up (detouring only once to make some fresh tracks). Overall it's hard to rate the route - the section we did was fairly easy, if quite a steady climb. 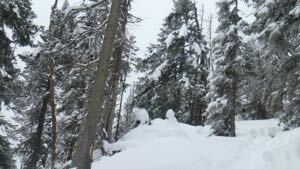 The technical section was difficult in loose snow, but would have been fine in more compact snow, or in touring skis. We reckon it's a hard WT2, made more difficult by the conditions - a useful lesson for us. I think this route would be great in summer, and keen to go back and try it sometime. In total we did 4.73 miles and 1800 ft ascent/descent in 3hrs15, including all breaks. The GPX track of our route is here. Equipment -5 to 0, no wind. (S) long sleeved base layer (only!) for ascent. Rab soft shell for descent and when stopped. Mammut trousers. (J) long sleeved baselayer, crag hoppers plus fleece for ascent and descent. Rab puffer vest when stopped. Thermal baselayer plus Odo trousers. Keen to try out our new snowshoes, Jules and I headed to Amden (actually Arvenbühl) to try one of the marked routes heading up to the Vordere Höhi. We arrived in good time and decided to set off on the longest (black) route, which had the option to shorten the distance at a few points. We made good progress up the slopes in easy and pleasant conditions, and decided to do the full distance. We stopped just below the Flügenspitz for lunch at about 1hr20, and then took a slight detour round the peak to avoid the very top. From there it was a short and pretty walk across to the restaurant at Vordere Höhi where we stopped for a Wurst and a drink in an old cow shed. We took another slight detour on the way down, to get off the main walking path, following a stream down through a gully along the yellow marked route. Equipment; -3 to +3 degrees, warm in the sun, no wind. (S) Long sleeved Rab T-shirt (only!) & Mammut trousers for ascent & descent. With gillette when stopped. (J) Long sleeved white top & Rab gillette for ascent. Craghoppers replace gillette for descent & when stopped. Keen to try out a slightly different type of skiing, I took Rory up on his offer of a day ski-touring. Owing to the avalanche forecasts, we opted for Soerenburg, which was at significantly lower risk than some of the more southerly peaks, but still an decent ascent. We set of at a fairly civilized 7:30 and arrived in Soerenburg at about 9:30. Rory kindly lent me skis and boots (more on that later) and after a brief check of the Avalanche transceivers we set off up the Hengst. The route up was fairly steady and easy – a chance for a complete beginner like yours truly to start to get familiar with the equipment. We proceeded steadily, with nothing more complicated than a couple of kick turns as the slopes got steeper. Unfortunately after about an hour I started to develop a blister on my right heel, which got steadily worse throughout the day - a useful lesson in making sure that your equipment works for you. The conditions deteriorated as we approached the summit, and in poor visibility we decided not to do the last 200 ft. (and neither had anyone else, according to the tracks). After a quick bite to eat we started down, taking a slightly different route than the way up, hoping to find some slightly steeper slopes so that we could ski. Things started well, with some nice cruising down gentle snowfields. However at some point we missed the preferred route, and we found ourselves picking our way down through steadily steeper trees. After about an hour of this we found ourselves in a slightly tricky spot, with our descent interrupted by a cliff. We backtracked and wound our way on down, by now completely off the path and quite slow going through the trees, with frequent falls as we encountered half-buried rocks and logs. Eventually we made it back almost exactly to the normal route, having had to take our skis off a few times to clamber over and round major obstacles. The highlight of the day was an untouched powder field (which is kind of the reason one goes, I suppose) and yours truly left a proper power wiggle track out of sheer exuberance. My GPX plot stopped at the cliff so I don't have a full track, but overall it was about 6.2 miles and 3,000 ft ascent/descent. The track that I do have is here. We eventually finished at 15:50 making it 6hrs5 for the day. Rated at WT2 with ski-touring equipment, and my legs were definitely tired at the top which affected my skiing at first. Equipment -10 to 0 degrees, no sun, 20mph wind at the top. (S) Thermal base top, Rab softshell, PeakPeformance trousers, Loipen gloves for ascent/descent. Rab waterproof shell when stationary higher up, and for the first part of the descent. 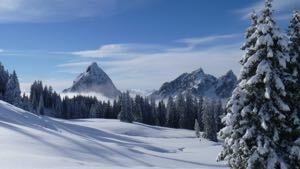 With a glorious day forecast, Jules and I set off for Einsieldn (actually Brunni) to have our second go at snowshoeing. After a fairly easy drive (with only one detour around the centre of Einsiedeln) we arrived at Brunni , and after a bit of faff with renting equipment (really must get our own) we headed off up the hill towards Furggelenstock. 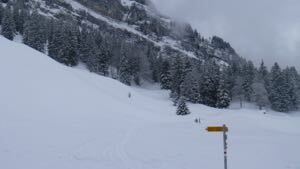 The conditions were great – bright blue skies and sunny, with fresh snow underfoot and a very pleasant temperature. We made fairly good time up to Furggelen where we found to our surprise that the Alpwirtschaft Furggelen was open. We stopped for a good bowl of soup and a bit of a rest before heading up to the very top of the Furggelenstock. The final "ascent" was a bit sheer, and a bit technical in snowshoes, but it was good to reach the top, and the views were rather special. After the obligatory photographs we headed on over the peak and down the other side of the hill before doubling back to Furggelen and descending back down the way we came. All in all it was a lovely afternoon out – great conditions, lovely views and very pleasant overall. We were a bit more familiar with the equipment, and as per usual the path was very well marked for the whole route. The 4.5 miles took us 2 hrs 45, not including lunch, and was a vertical ascent/descent of 1,867 ft. We'd rate it as B for effort & difficulty. The GPX plot of our route is here.